Lymph Drainage Therapy (LDT) is a gentle touch method of promoting lymph drainage developed by French physician Bruno Chikly. Dr. Chikly's method offers a highly efficient approach to working with the lymphatic and other fluid systems of the body for maintaining good health and immune functioning. 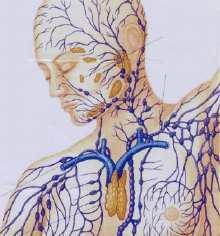 The lymphatic system is a system of lymph fluid movement that parallels and works with the circulatory system. It is responsible for helping fluid and waste removal from the body and for regulating the immune system. When the lymphatic system becomes blocked, fluid builds up and stagnation occurs, causing all or part of the system to become toxic. The end result is that we feel sluggish and the immune system is comprimised. This means that we are more susceptible to viral or other disease processes that the immune system would normally be able to clear out. LDT improves the activity of the lymph vessels and in the case of lymphedema re-routes the lymph flow around the blocked areas into more centrally located lymph vessels that drain into the venous (circulatory) system. The gentle manipulations of LDT can potentially improve the functioning of individual organs, the systems the organs function within, and the structural integrity of the entire body, as well as other benefits. LDT is a modality that allows the practitioner to manually attune the specific rhythm, pressure, quality and direction of the lymph flow with a combination of precise manual techniques. LDT allows the practitioner to manually release areas of fluid stagnation within the lymph system. By stimulating this system through massage, it works more efficiently, which in turn boosts the immune system, clears blockages, eliminates toxins, transports nutrients to cells and in turn, increases the body's metabolism. Lymphatic drainage is a form of light touch massage carried out by a specialist practitioner. In the initial session, consultation determines the clients needs and the probable number and frequency of future sessions that might be needed. LDT utilizes a very light pressure combined with soft massaging movements in the direction of the lymph nodes. The process may sometimes focus on a localized area, progressing to working on the whole body, depending on client symptoms and issues being addressed. What is LDT helpful for? Manual Lymph Drainage is the treatment of choice for the condition known as Lymph-edema, but other conditions also many benefit. LDT has been used successfully to treat post-surgical and post-traumatic swellings, sports injuries, chronic venous insufficiencies, amputee stump edema, migraine headaches, rheumatoid arthritis, fibromyalgia and swellings of other origin. LDT is also frequently used for detoxification and general relaxation. LDT is also useful for individuals who suffer frequently from common illnesses like colds and flu. It stimulates the immune system and improves it's functioning. LDTis also used to reduce puffiness or swelling. It has been cited as having a positive effect on problem skin, cellulite, dysfunctional respiratory systems and boosts those with low energy. What are the benefits of LDT? Lymphatic drainage massage boosts the immune system so, as well as helping the body ward off illness, treatment can facilitate general feelings of health and vitality. It also has a positive physical effect, improving the appearance of the skin and reducing puffiness caused by water retention, poor circulation or pregnancy. As with other massage, it can help with pain from fractures and sprains and rheumatism, and it promotes the bodys own healing mechanisms. Lymphatic drainage massage utilizes very light pressure and is quite soothing to receive. What are the Side Effects and When should LDT be avoided? Lymphatic drainage should not be used by people with current acute inflammation, malignant tumours, thrombosis or major heart problems. Because of its effect on the immune system, people with cancer, diabetes, thyroid or kidney problems, asthma or epilepsy should seek medical advice before receiving treatment. It is also advisable that women do not undergo lymphatic drainage during time of menstruating. Ask your practitioner for any other questions. Always drink plenty of water after sessions.